Richard D’Oyly Carte, English composer, talent agent, impresario and hotelier, was born in the West End of London on 3rd May 1844. He was instrumental in bringing together W.S. 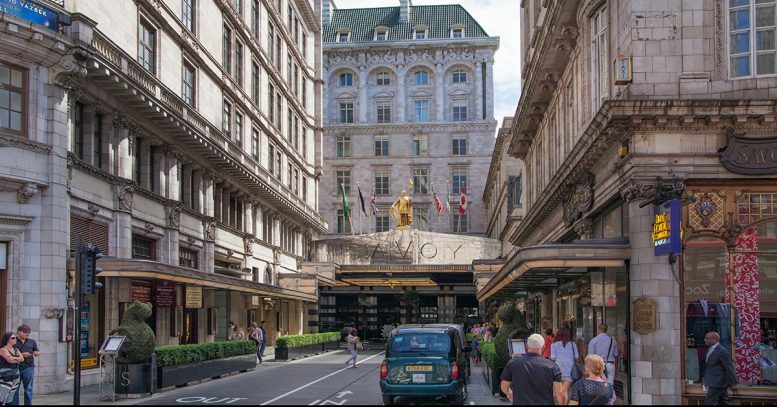 Gilbert and Arthur Sullivan, as well funding and creating two of London’s theatres, an opera company and the incredibly successful Savoy chain of hotels. Carte was born into a family that appreciated the arts. His father, Richard, originally a flautist, ran a successful music publishing and instrument manufacturing business, whilst his mother, Eliza, ensured he and his siblings were cultured in art, music and poetry. They spoke French in the family home for two days of each week, went on frequent theatre trips and learnt various musical instruments – with Carte learning both the flute and violin. By the age of 24, Carte was writing and publishing his own songs, instrumental works and comic operas, as well as partaking in amateur dramatics – skills that would prove helpful in his later career. He also started up his first enterprise; a concert and theatre management company, from within his fathers’ firm. He had over 200 clients on his books, including Mr and Mrs German Reed and Oscar Wilde. His desire, or ‘scheme of his life’, as he referred to it, was to make comic opera as popular as the more risqué French works, but with a family friendly environment – and it was this desire that enabled him to bring W.S. Gilbert and Arthur Sullivan together. In 1874 he took on the lease for the Opera Comique, announcing on the front of the programme, his ambition to give a permanent abode to light opera. Unfortunately, he didn’t yet have the funds in place to realise this dream and he ended the lease. He subsequently wrote to Gilbert, admiring his work and talent. But it wasn’t until a year later, when he was manager of the Royalty Theatre and looking for another piece to add to a programme, that he thought of Gilbert’s one-act piece ‘Trial by Jury’. He suggested Sullivan write the music for it. 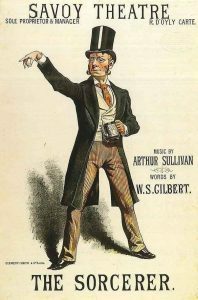 Both Gilbert and Sullivan agreed, as they both shared the same vision Carte had for comic opera. In 1877, with the help of 4 backers, Carte launched the Comedy Opera Company. He wanted to show primarily Gilbert and Sullivan operas, but also those of other British author/composer teams – and he took on the lease of the Opera Comique – premiering Gilbert and Sullivan’s ‘The Sorcerer’. He was able to use both well-known actors, as well as providing many of the artists from his own agency. This was followed with another Gilbert and Sullivan opera H.M.S. Pinafore’. In 1879 the three men agreed to go into partnership, each investing £1,000 in return for a 1/3 of the profits – and ‘Mr Richard D’Oyly Carte Opera Company’ was born. It later became known as the ‘D’Oyly Carte Opera Company’ – a partnership that was to last for the next 11 years – only to end in 1890, with the infamous ‘carpet quarrel’. The company became the sole authorised producer of Gilbert and Sullivan’s works and introduced the practice of licensing amateur theatrical societies the rights to present works. They also implemented the sale of scores and libretti, plus the rental of band parts. Carte was a shrewd business man. In 1880 he bought up property along the Strand with the proceeds of his business and partnership, in order to build his first theatre in 1881 – The Savoy Theatre. This was a state of the art theatre, setting a new standard for technology, décor and comfort, as well as being the first to have electric lighting. This was following in 1889 with his first hotel – The Savoy – the first hotel to have electric run lighting and lifts. He subsequently went on to buy Claridges, Simpson-in-the-Strand and Berkeley hotels in the 1890s. During the latter part of the 1890s, Carte’s health was in decline. He passed most of the management and running of the hotels over to his wife, Helen. Later, in 1897, his son (Rupert), took on the role of assistant – and both Helen, Rupert and granddaughter Bridget, continued running the hotel chain until 1994. Carte died of dropsy and heart disease in 1901. This incredibly influential, innovative and shrewd business man left a legacy valued at £250,000 – equivalent to several hundreds of millions in today’s financial worth.